I wouldn’t necessarily say it is funny. It is just another example of the homeless/public inebriation problem hereabouts. It is me or is the intersection of Manhattan Avenue and Greenpoint Avenue looking more “populated” than usual? And by “new” folk? Seriously. Yes. It is more “populated” than usual. In fact, I saw a group of homeless guys hanging out at that same bus shelter the other day. Channel 12 news said that the man found in Newtown Creek the other day, was probably homeless. To me, it seems like we’re hearing about too many homeless deaths as well. 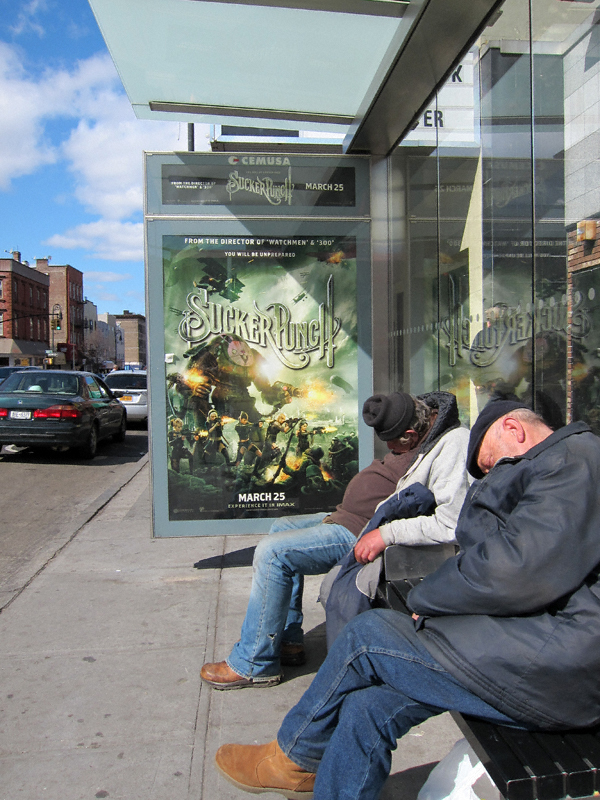 We’ve heard of at least one publicized homeless death per year in N. Greenpoint alone. Remember the homeless guys that froze to death in the factory area? The one that hung himself? How many don’t we know about? It’s horrible. What even worse is that the city isn’t dealing with the problem. They’re just looking to plop an unrelated facility in this community to serve inmate reentries. They should deal with the people that are already here and in need of help. @SC: Agreed. I’d like to know from Muzzy and the DHS exactly what the process is for a homeless person here to get into our new proposed “assessment center”. I’m guessing he (or she) would have to go to Manhattan so as to get processed and come back here. Yeah, like THAT’S going to happen. I am not from Greenpoint and I don’t live there, so I don’t recognize this area. All I see when I look at this picture are two guys sitting on a bench in the sun who are having a nap. I wasn’t trying to be condescending about the homeless/public inebriation problem. @Nellies: Understood (and yes, the juxtaposition with the ladies of Suckerpunch is kind of funny). For the record (!) they are two of our more chronic (and harmless) public inebriates. A lot of these guys have family in the area. It makes one wonder if lack of outreach/social services are to blame for them living on the street. As I stated previously, we’re faced with the prospect of a 200 bed homeless assessment center. You can imagine this rankles folks when we (and/or our city) seemingly cannot take care of our “own”.